Signed and numbered by the Estate of Jean-Michel Basquiat. Accompanied by a Certificate of Authenticity. 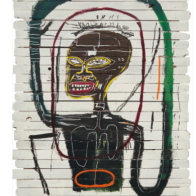 Authenticated by the executor of the Jean-Michel Basquiat estate. Accompanied by a Certificate of Authenticity. Stamped and signed by Lisane Basquiat and Jeanine Heriveaux, the artist;s sisters and administrators of the Estate of Jean Michel Basquiat. Authenticated by the Estate of Jean-Michel Basquiat.